Ireland’s West Coast exudes a romance like nowhere else in Ireland. It boasts an unsurpassed beauty and wild drama that is inextricably linked to the region’s culture, traditions and people. Ablaze with colour, it offers the chance to really get away from it all, to stand on the edge and face nature in all its glory. 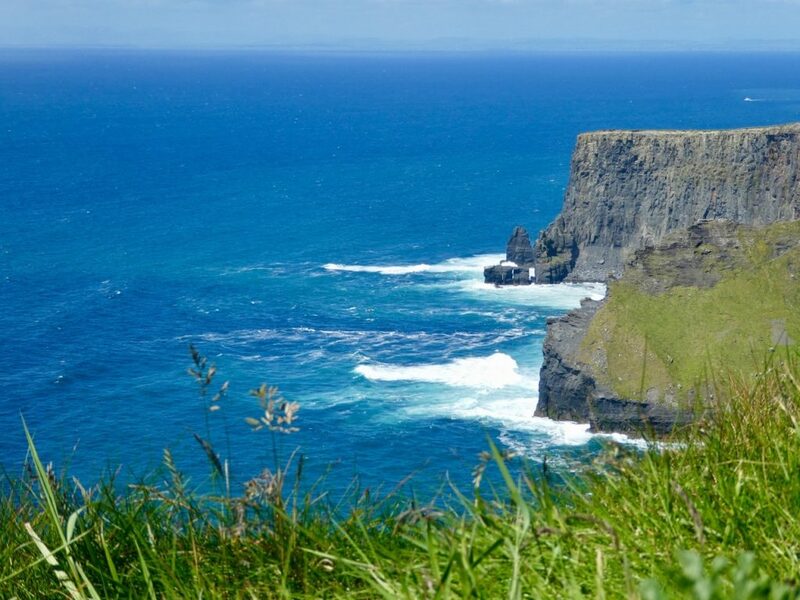 Here you can immerse yourself in the authentic Irish experience, from the vibrant Gaeltacht (Irish-speaking) areas and their lively céilis (Irish dancing) to the multitude of festivals that celebrate the history and heritage of this fascinating region. 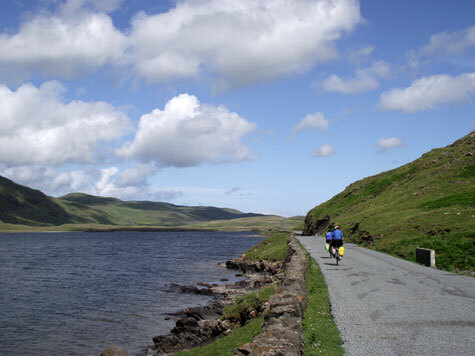 Our guided cycling tour itinerary ticks all the “must do” and “must see” boxes for the West of Ireland. 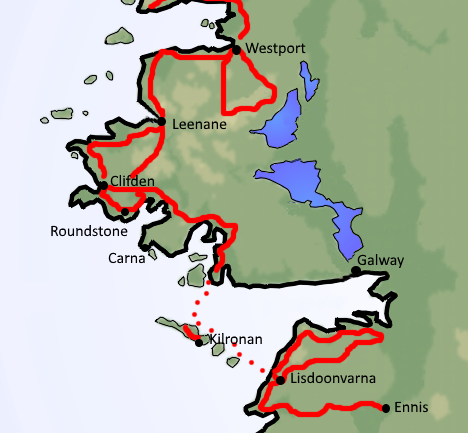 You will travel through Connemara, The Burren, Galway, Mayo and the Aran Islands. 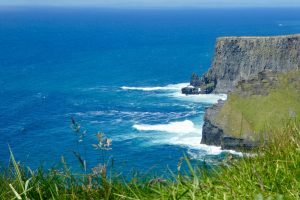 The attractions that you will visit along the way include the Cliffs of Moher, Dun Aengus clifftop fort, the Sky Road, Kylemore Abbey, Doolough, the Twelve Bens, Killary Harbour, Croagh Patrick……and many more. It is also a perfect tour for a non-cyclist accompanying you on your cycling trip. The tour is limited to 16 participants. The package will include airport transfer from Shannon Airport to Ennis, 10 night’s accommodation (including breakfast) in a variety of excellent 3* and 4* hotels, 7 full dinners, sag support, daily pre-ride briefing, cycling options to cater for both the leisurely and the not-so-leisurely cyclist. Arrival in ancient Ennis, 15 miles from Shannon Airport from where we will transfer you. Ennis, the county town of Clare, is one of Ireland’s most attractive market towns, being surrounded by the River Fergus. Dominating the town is the ruined 13th century friary in which there are some wonderful medieval sculptures. In the afternoon there is a bike and equipment fitting after which you are free to explore the town or to relax. There is a meet-and-greet and a short tour briefing before dinner at the hotel. Our accommodation in Ennis is the Old Ground Hotel. From Ennis we cycle north through tiny villages and past sheep dotted fields all on quiet back-roads to Lahinch for lunch. Afterwards we cycle to the awesome Cliffs of Moher, the final stage takes us to Lisdoonvarna, location of the annual matchmaking festival. 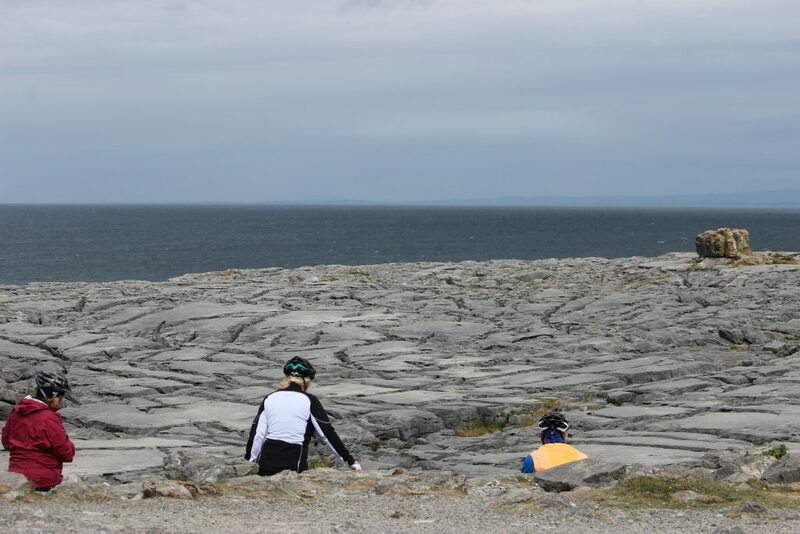 Today you will enjoy one of Ireland’s classic coastal rides, with wonderful vistas all the way along the dramatic Burren coastline. Leaving Lisdoonvarna we descend to the coast and pedal north along the majestic Atlantic shoreline. After rounding Black Head we follow the southern shore of Galway Bay to the town of Ballybaughan, and a welcome lunch stop. A short distance south of the town is the remarkable Ailwee Cave. There is a good climb from here onto the Burren escarpment to view the Poulnabrone Dolmen from where we follow tiny country lanes back to Lisdoonvarna. 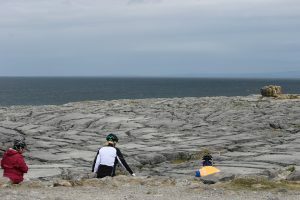 After breakfast we cycle to Doolin Pier to catch the ferry for the 65 minute crossing to Kilronan port on Inishmore, largest of the 3 Aran Islands. We will explore the village before riding out along the coast road to Dun Aengus, the Stone Age cliff top fort that dominates the western end of the island. 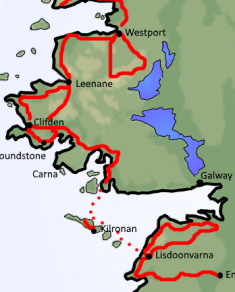 There is the option to continue the ride to the very western tip of the island, before returning to our Kilronan hotel by the scenic inland route. After dinner you can join in the fun at a traditional session in one of Kilronan’s pubs. Accommodation in Kilmurvey House. After breakfast there is plenty of time to visit the Black Fort and to ride out to the eastern tip of the island before embarking on the noon ferry to Rossaveal on the northern shores of Galway. The cycle from here takes us towards the distant Twelve Bens, the mountain range that dominates the centre of the Connemara landscape. A longer more testing option follows the coast while a shorter option traverses atmospheric moorland (where you can watch peat being dug for fuel) to the tiny coastal village of Cashel, where we will stay in the Zetland Country House Hotel. 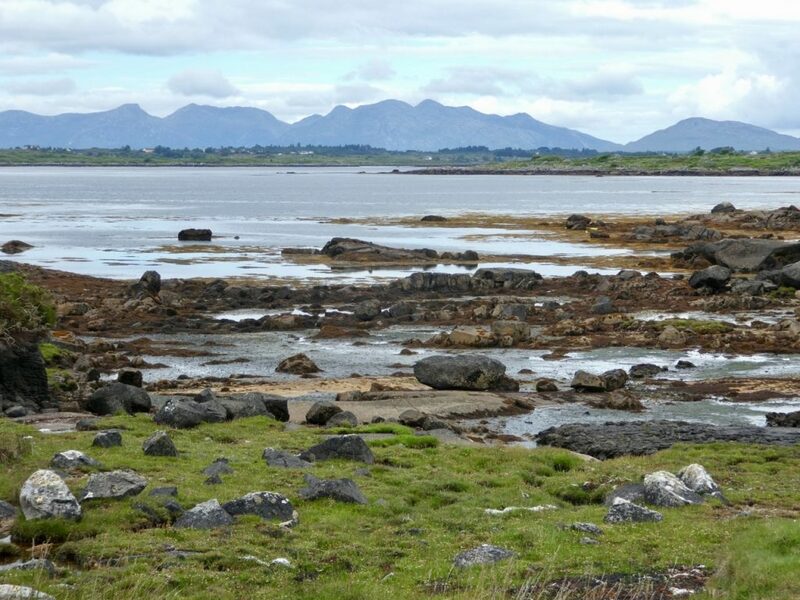 Continue your cycle along the coast via Roundstone where you can see traditional musical instruments being made by hand. On the way you come past the village of Ballyconneely and the site where Alcock and Brown crash landed their biplane after completing the first transatlantic flight in 1919. 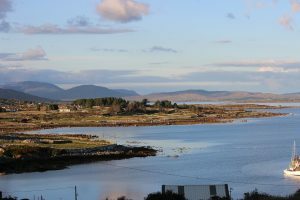 Cycling along the beautiful Connemara coastline we will arrive in Clifden, where for the next two nights we will stay in the old harbour master’s house, now a beautiful boutique inn. 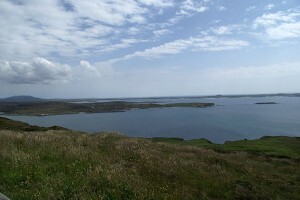 Enjoy a day out of the saddle perhaps go horseback riding or deep sea fishing, or head for Inishboffin Island. 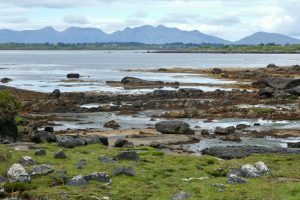 But if you do want to go cycling there is a wonderful bicycle ride out along the Sky Road to enjoy some sublime coastal scenery.Along the way walk to the ruin of Clifden Castle. 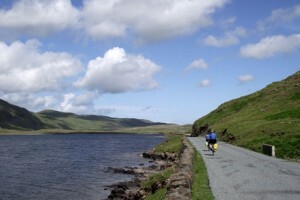 And if you wish for more cycling then continue along more coastal scenery to Claddaghduff and Aughrusbeg. 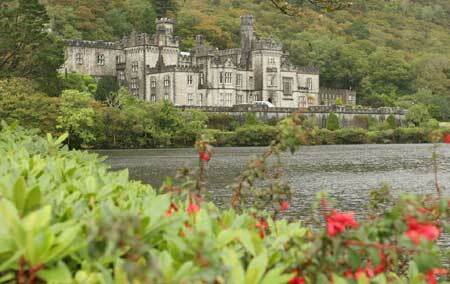 Leaving Clifden we follow the remote, scenic Bog Road to the impressive Ballynahinch Castle for a morning coffee. 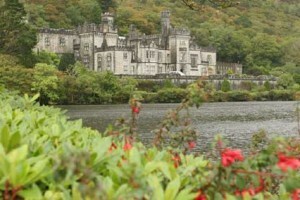 From here there is a beautiful ride up the Lough Inagh Valley to Kylemore and the opportunity to visit Kylemore Abbey, one of Connemara’s best known attractions. The ride around the coast from here via Tully Cross is especially impressive. The last section follows the southern shore of Killary Harbour, Ireland’s only true fjord, to Leenane. There is the option to take an educational cruise on the waters of the fjord before dinner. We stay in the Leenane Hotel overlooking the harbour. From Leenane we head along the northern shore of Killary Harbour and into the beautiful Delphi Valley and past the very atmospheric Doolough Valley to Louisburgh, one of the homes of Grace O’Malley, the pirate queen of the West of Ireland. From here we follow the Clew Bay coastline east towards Westport. 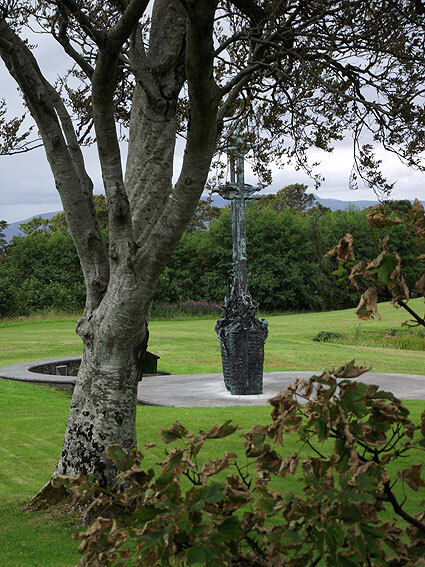 On the way we pass the striking sculpture which commemorates the ‘coffin ships’ that carried countless thousands of Irish emigrants to America. 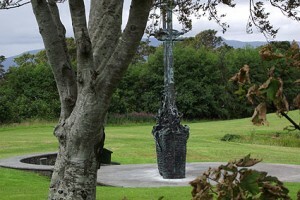 Close by is the foot of Croagh Patrick, Ireland’s holiest mountain and a popular destination for pilgrims. 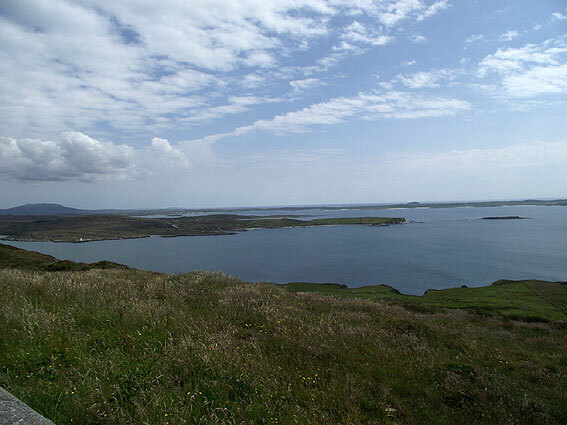 The steep path to the summit is rewarded by fantastic views over Clew Bay. And yes – you can climb it if you have the inclination (and the energy! – best to do it the next day).Our destination is the bustling town of Westport, situated at the head of island-strewn Clew Bay. We stay in the beautifully luxurious Westport Plaza Hotel & Spa. Various options are available for today, hike Croagh Patrick, cycle the Greenway one of Ireland’s only dedicated cycle trails along the route of the old railway line from Westport to Achill or alternatively there is a loop ride available into the Partry Moutains and over to Tourmakeady before returning to Westport. Our farewell dinner is back at our Westport hotel. You might like to top off your tour with a visit to one of the town’s many musical pubs – Matt Molloy’s (Matt of Chieftains fame) is a favourite. Breakfast, followed by farewell and departure for your onward journey. The Best of the West Ireland guided cycling tour is designed to stay in the most beautiful and luxurious hotels along the way. These are small boutique style houses offering outstanding food and service as well as some of the best views in Ireland. 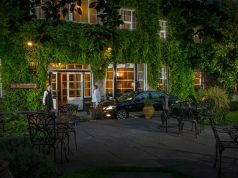 Since opening its doors in 1895, the Old Ground Hotel has always been considered a home away from home, a truly magical retreat that blends the warmth of a country home with the style and luxury of a contemporary Irish hotel. A beautifully restored 18th century manor house set in the centre of Ennis town, there is a sense of character and a vibrant atmosphere running throughout this beautiful property. The Quay House is Clifden’s oldest building, dating from ca 1820. It was originally the Harbour Master’s house but later became a Franciscan monastery, then a convent and finally a hotel owned by the Pye family. Now providing boutique style inn accommodation in Clifden, it is run by the Foyle family, whose forebears have been entertaining guests in Connemara for nearly a century.The Quay House stands right on the harbour, just 7 minutes walk from Clifden town centre. 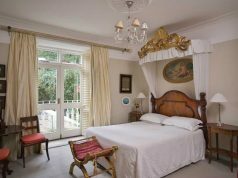 All rooms are individually furnished with exquisite antiques and original paintings; several have working fireplaces. All have large bathrooms with tubs and showers.